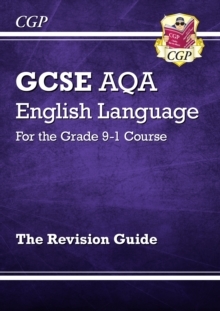 This CGP Revision Guide is the perfect companion to the new Grade 9-1 AQA GCSE English Language course. Every Reading and Writing skill is clearly explained, and there's a big focus on helping students develop their exam skills throughout the book. For each topic, there are exam-style sample questions with fully worked answers, and at the end of the book you'll find step-by-step guides to tackling Paper 1 and Paper 2 - complete with sample answers to show students what's needed to achieve grades 4-5, 6-7 and 8-9. For extra practice, a matching CGP Workbook is also available (see 9781782943709).